Beverly Hills Cop confirmed Eddie Murphy's status as a superstar. The action/comedy was, financially speaking, the number one movie of 1984, and its screenplay was nominated for an Oscar. What ended up becoming one of AFI's Top 100 comedies of all time was very close to becoming a completely different movie featuring Sylvester Stallone, more gunplay, and far less humor. Thirty years after its premiere is as good a time as any to read about the crazy behind-the-scenes journey that got Axel Foley from Detroit to Beverly Hills. In 1975, long before he would become the CEO of Disney, Michael Eisner was driving a beat-up station wagon around Hollywood, despite his impressive title of president at Paramount Studios. After he got a speeding ticket from a cop with "an air of superiority and quiet condescension," he bought himself a Mercedes and came up with the germ of an idea to make a movie about a Hollywood police officer. For what it's worth, Paramount executive Don Simpson allegedly claims Eisner was wrong, and that he came up with the idea himself. Danillo Bach was hired to write the script, and in 1981 he submitted a draft titled Beverly Drive. In Beverly Drive, a Pittsburgh cop named Elly Axel shows up in Beverly Hills to investigate his friend's death. That loose plot remained throughout the remainder of the creative process. Michael Eisner felt that the draft, and all the others before it from different screenwriters, didn't capture the fish-out-of-water aspect enough. Daniel Petrie Jr.'s script was the one Eisner, Don Simpson, and his fellow Paramount producer Jerry Bruckheimer liked. Petrie injected comedy into his version after talking to cops and noticing that they told "tremendously funny stories, punctuated by the most gruesome violence." He also nailed the outsider aspect Eisner desired, drawing from his experience as a poor writer walking to his expensive-looking Beverly Hills office past stores full of high-priced clothes and art that he could never afford. With the project fast-tracked in 1983, Mickey Rourke was a hot commodity, fresh off his Diner performance as Boogie. Rourke made $400,000 by signing a holding contract, going back and forth with the studio and the writers on ideas for the script, and then walking away when his contract expired to look for work elsewhere. Stallone reflected that when he first received the action/comedy script in the mail, he thought it was sent to the wrong house. The actor, who by 1983 had already written the first three Rocky movies and First Blood, re-wrote Beverly Hills Cop to better suit his strengths, making it into a pure action flick as it had been before Petrie Jr. took over script duties. In Stallone's ending, Axel drives a stolen Lamborghini towards a freight train being driven by the Big Bad. 5. STALLONE LEFT WEEKS BEFORE SHOOTING BECAUSE OF ORANGE JUICE. MAYBE. The Hollywood legend is that Sylvester Stallone abandoned the project thanks to failed negotiations over what type of orange juice was to be kept in his trailer. The official explanation was that Stallone's script made the budget skyrocket, and Paramount did not want to spend all the extra money. A majority of Stallone's script went into his 1986 movie Cobra, and as a nod to Stallone's involvement, Judge Reinhold's character Billy Rosewood has posters of both Cobra and Rambo in his room in Beverly Hills Cop II. Murphy, coming off roles in 48 Hours and Trading Places, was brought in to save the day. Petrie Jr. came back and finished a final version of his script, but both he and director Martin Brest weren't completely satisfied. Brest encouraged Murphy to make up funny stuff on the spot, and Murphy came through on multiple occasions. The former SNL cast member rarely drank caffeine, but after drinking a cup of coffee, he ad-libbed his spirited "supercops" monologue. With the screenplay reworked constantly, sometimes actors were given their lines right before they were supposed to say them. This was an issue for actor Stephen Elliott, who was caught with his rolled-up script in his hand as he was playing police chief Hubbard. Fortunately for him, his director thought it made him more look the part, and in the film, Elliott is holding those script pages. When Stallone was still signed up to play the lead, Scorcese was offered the director's chair. Scorcese was "bewildered," and dismissed the concept as too similar to the movie Coogan's Bluff. In that film, Clint Eastwood was a deputy sheriff from Arizona who travels to New York City to hand over a fugitive. Martin Brest was fired from his second directing job, WarGames, and the industry thought he was damaged goods. Don Simpson and Jerry Bruckheimer disagreed, and the two Paramount executives continually called Brest and asked him to direct Beverly Hills Cop. He kept declining, before eventually taking his phone off the hook. Simpson took the hint, but Bruckheimer kept trying, and to end the harassment, Brest decided to flip a coin to make his decision. The coin told him to take the job. Pinchot's performance as Serge the gallerist, which led Brest to call Pinchot the "American Peter Sellers," helped him obtain his iconic role of Mypos native Balki Bartokomous on Perfect Strangers for seven seasons. But because of the movie's repeated production delays and his scheduled trip to Florence, Italy, Pinchot grew restless and said that if they didn't start production, he would have to drop out. Pinchot made this ultimatum despite being a virtual unknown. Most of the scenes set in Detroit were actually shot there. An off-duty police officer accompanied Martin Brest and his crew during filming, but he refused to go with them when they entered a housing project. Detroit PD was more helpful when producers were researching police procedures, though, when a detective took them to a murder site. Since the incident occurred across the street from Mumford High School, Eddie Murphy wears a Mumford shirt throughout the movie. The classic instrumental theme written and performed by Harold Faltermeyer was made using a Roland Jupiter 8, a Roland JX-3P, and a Yamaha DX-7. The song reached #3 on the Billboard U.S. charts. Faltermeyer also co-wrote the Glenn Frey song "The Heat is On" for the film's soundtrack. The Beverly Hills PD did not provide access to their headquarters, so Martin Brest and staff simply built a set that would look like the exact opposite of the Detroit police department, "like private security for all rich people." The set was influenced by Brest's original conceptual designs for the NORAD scenes in WarGames. Like Stallone would do with Cobra, Brest recycled his unused work because he felt that he spent too much time on it to never use it. In the script, Axel stuffs potatoes he stole from the hotel kitchen into the tail pipe of Rosewood and Taggart's car. Due to time constraints, no scene from the kitchen could be shot. Because the hotel lobby was already a location for a few scenes, the script was re-written so Axel takes bananas, with Damon Wayans' approval, from a buffet in the lobby. Beverly Hills Cop II was released in 1987 to mixed reviews but still made over $135 million, and the third movie only made $42 million in the United States. An updated TV series was pitched to CBS in 2013, but despite Eddie Murphy's participation, the network passed after seeing the pilot. 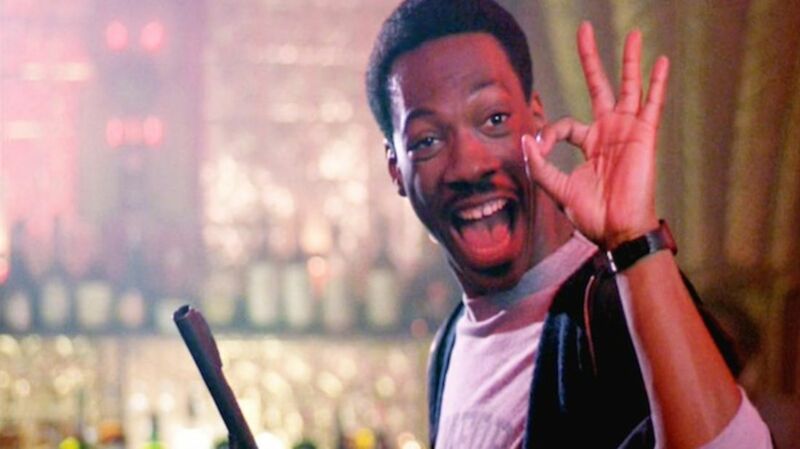 All is not lost, because a primarily Detroit-based Beverly Hills Cop IV is due to arrive in March 2016, with Murphy reprising his role as Axel.